Or simply download the following war file from my Bitbucket repository and deploy it to a valid web container like Tomcat, Jetty etc..
You only need to add the following dependencies to your pom.xml to use REST-assured and – of course JUnit.. I have added some examples for different scenarios to test .. headers, status codes, cookies, file uploads etc ..
We’re testing a simple response containing some JSON data here .. This time we’re using JsonPath to programatically test the returned JSON structure..
JsonPath allows us to use Groovy closures to perform searches on the returned JSON structure. To validate complex XML structure XPath is way more comfortable here..
Now an example how to verify HTTP headers – in the following example, a 404 Page Not Found is returned .. In this example we’re handling basic authentication ..
// we're not authenticated, service returns "401 Unauthorized"
In the following example we’re setting some HTTP headers. The value of the HTTP header named “myparam” is returned by the REST service in the response body.. The following example shows how to set cookies. The REST service sends a 403 / Forbidden until a cookie with name=authtoken and value=abcdef is send. The following example shows how to handle file uploads. We’re sending a text file to the REST service and the service returns the file content as a string in the response body. body(equalTo("This is an uploaded test file.")). Another nice feature of the REST-assured framework the possibility to create specifications and reuse, modify or extend them in several tests. View more presentations of mine. Please feel free to have a look at these tutorials of mine covering different aspects of handling or creating RESTful webservices. 2018-06-01: Embedded Slideshare presentation removed (GDPR/DSGVO). 2015-08-06: Links to other REST articles of mine added. This entry was posted on Sunday, October 23rd, 2011 at 4:59 pm	and is filed under Java, Web Services. You can follow any responses to this entry through the RSS 2.0 feed. You can skip to the end and leave a response. Pinging is currently not allowed. That’s really nice. How do you get the exported view? Is that a default Jersey feature? I know the wadl is produced, but didn’t know this part. Thanks for your examples too. Very helpful. We are trying to work out whether to use something like this, jbehave, or custom…. Where can I find the demo application war file? Hi, you can download the war file from my Bitbucket repository. Thanks for the .war. I didn’t see it when I was looking at your Bitbucket repository. Now that I’ve got the .war deployed and tomcat running, I tried your example for testGetSingleUser(). I had to change get(“/service/single-user”); to get(“/rest-assured-example/service/single-user”); in order for it to find the resource and return a status code of 200. Thanks for any help you can provide so I can understand how this works. Works for me .. using mvn tomcat:run as well as using a deployed war archive on a tomcat instance. but I’ve noticed that the xpath expression was not well defined and precise enough .. I’ve fixed this and updated the example .. thanks for mentioning! Thanks Micha. The new code works. Hello, Micha. Excellent tutorial. If I use the War file, the path is no longer localhost:8080, but becomes http://localhost:8080/rest-assured-example/. This causes the tests to fail. How do I fix this? I am currently looking at your source code to find it. unable to do your public void testFileUpload() on JUnit? Everything else works. No problem :) Are you getting any error here? Does the file exist in your classpath? Have you modified the original example somehow? Does the servlet container return any error or is there an error displayed in your server’s logs? I see the file in the project as you listed it, and have not changed anything. Hmm.. could you please run the test using some external file and an absolute path? Have you included the dependency for jersey-multipart (com.sun.jersey.contribs:jersey-multipart) in your project? Micha, I don’t know why but I searched and the solution was to move the test.txt to the \target\classes folder. 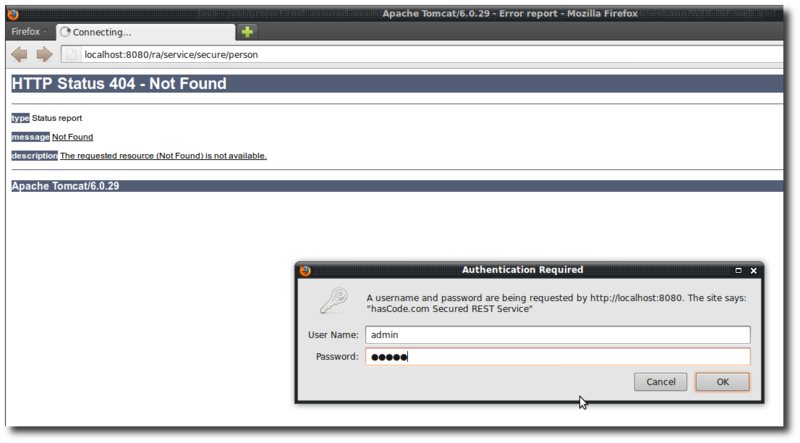 I took the last war file and deployed it on Tomcat 7, I get a 404 error for every REST call from your welcome test page. I took the same war file, and installed it on another machine with Tomcat “Apache Tomcat 6.0.36 “, Java “C:\Program Files\Java\jre7\bin\client\jvm.dll”, everything works fine. Does anybody had the same problem ? Thanks for putting together such a nice tutorial! It is really helpful for me to understand rest-assured better. I am trying to figure out what framework to use for my rest web service testing and have some further questions on rest-assured for you. Do you happen to have an example to use rest-assured for https web service? Also for a web service that supports both xml and json, is there any way to write same test to handle both these two response format? If not, the tests will double :(. Also for a test case, say, 1. user A (may be an admin user) logs in, 2. A create a user B, 3. A then retrieves user B’s info to verify that user B is created correctly. step 2 and 3 will need to send out the cookies returned from step 1. Will tester have to set cookie in each request? i was hopping that rest-assured will support updating some default cookies based on server response, then the next http request will by default send the updated cookies. Do you happen to know if this is supported by rest-assured? Have you assured that your REST-service is responsive? By adding .log().all() to the response and request specification you’ll receive detailed information what the client sends to the server and the server’s response. Again, thank you for this very nice tutorial (today is the third document I read from you about REST-Assured and Jersey Testing Framework… I am evaluating which one to use, and inclining to go with REST-Assured)… this very nice coverage of several capabilities of REST-Assure, with code to test as we read!! Further information can be found in the rest-assured documentation. Thank you detailed explanation. I am not able to resolve my issue by using relaxed https validation. here is the http response what i am getting. Expected status code doesn’t match actual status code . Kindly help me how to resolve this issue. Are you sure that your base URI and port specification is applied? In your response I’m reading “http://stage3…” and port 81? Thanks for quick response, i am new to Rest Assured and all our services can access only https. I am really not sure how to check port specification applied, but yes…wat ever i change i am getting test is happening only on port81. Kindly help me to debug and fix the issue. Do you override this setting somewhere? rest assured’s default port is 8080, host=localhost .. When running in a JUnit test you could use the setup method to set your requirements here .. I am not overriding any settings as i am not aware of these procedure:(. Can you please help me in more detail and i am using testng runner. it returns following error: Connection to https://stage3.test.com:1234 refused. Good to hear, that adjusting your test to your specified port and connection type is working for you now! sorry, its not correct port.. i just tried with some dummy port which resulted into connection refuse. I need still your help on port overriding to 443. Kindly help me on this. i am new to Rest assured and this is my first trial… please let me know how to resolve this issue. I have added trust store, here is the next error i am getting. I’ve added trust store, still i am getting below issue. Please help to proceed further. Seems like you’ve managed to handle the HTTPS problems. Is https://stage3.test.com/services/api/v1/product with method=GET and content-type header application/json correct? Are you able to access the webservice using curl or since it’s using GET .. your browser when using the designated target? This is my code. Actually when I am entering URL using get(), I am getting LOGIN page of ALM. I want to login using required UN and PWD. I googled for this and got this solution but its not working for me. Please help me for this if you know, What to do in this. Thnx for your valuable reply and time u have given to me. I used your code. But I am not able to identify how do I check whether I logged in or not. I am using asString() to check whether next page displayed or not but it is showing login page only. Other thing is should I use post() for this or get() will be fine? I did not get form-based authentication? what it means ? Can I get some examples or applications like you provided where I can work on put() and delete() functionality of rest-assured? I already did get() and post() with the help of your application only. Thanks in advance. And yes, the last solution you told me about login to QC-ALM not worked. I don’t know what to do. So I skipped that and worked on some other functionality. If you have any other solution, please let me know. use put() or delete() just like you would use get(), but put() accepts a request body though. In this I want to login using rest assured(I want to authenticate ALM user with rest assured); step 1 given in this link. If it is successful then I can get or delete any information I want like get a bug or delete bug like that. If login is successful then only I can proceed and rest apis spring security method works for older version of ALM. So for new version it is not working. Can you help me in that? Afterwards you should have gathered everything you need to know to reproduce the login process with rest-assured. Hi Micha really appreciate for the nice website . How do i test @post i have seen a lot of tutorials on @get, but none so clear on @post. Thank you. Hi, Micha! Is Rest-Assured used only with localhost or can I use it with real URL address? you may use rest-assured with every hostname or ip address you like e.g. expect()…get(“http://www.yourdomain.com/”). Thank you very much, Micha! I really appreciate your help! I want to do restful web services testing in java 1.5 environment. Is there any tool/package to help me out ? I guess rest-assured is for run time environments jvm > 6 . It was really a nice article. I loved the way you explained. I am beginner and this single article is good enough to learn rearest assured. Can you please provide some examples for POST, PUT and DELETE methods. Consulta, quiero testear un servicio REST con varios puntos de entrada REST. Para probar los puntos de entrada tengo las URL, pero para probar las peticiones en las urls tengo el wildfly levantado (que es el mismo que se utilizará para los datos reales de la BD). Mi consulta es: hay alguna otra forma de probar las entradas REST pero sin utilizar el wildfly? Si existe, cómo podría hacer esta prueba? “Request URL: /service/single-user”, antes levantaste el Widlfly? lo siento, no hablo español. Could you repeat your question in english please? If you’d like to know how to test a RESTful webservice running on a WildFly application server then Arquillian is your tool of choice and I’m using Arquillian and rest-assured to run tests for a couple of Java EE projects by now and it’s working fine. My question is: is there any other way to test the REST entries but without using the wildfly? If there is, how could I make this test? “Request URL: / service / single-user” before you raised the Widlfly? 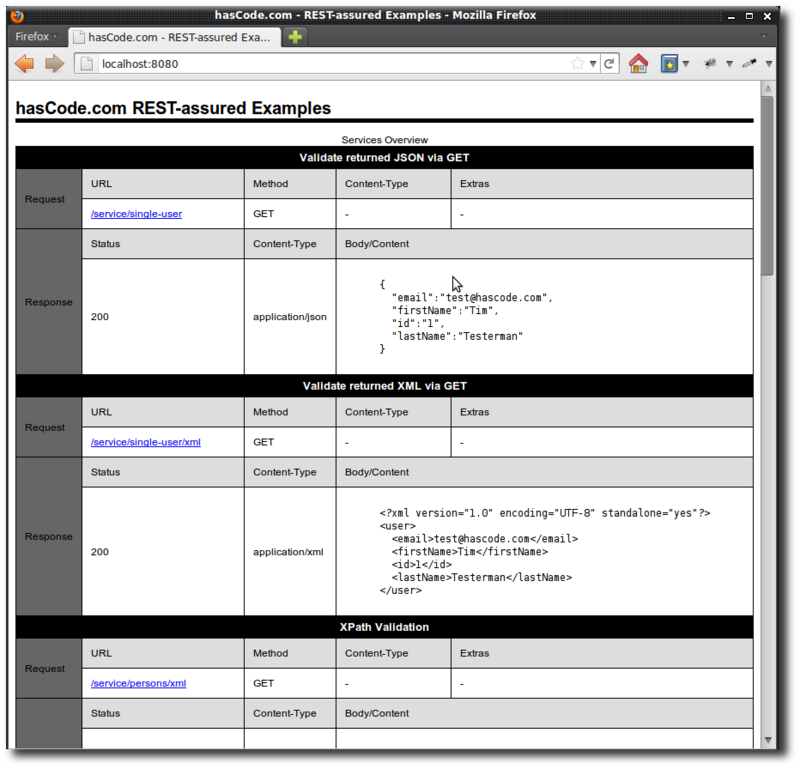 you don’t need WildFly to run rest-assured. You may use it in a normal JUnit or TestNG test, too. Simply ensure that the RESTful webservice under test is running and add the rest-assured tests. Could I help you with this answer or do you need help for a special setup? I am using Restassured for checking the API. i have one api which redirects with 302 (https://www.qe5.ut1.omniture.com/p/suite/1.3/index.html?a=Landing.Main&ims=1) and ends with opening a new webpage with my login. This call always takes me to the login page. There are 5 calls in between. What am in missing in this? 2) Write a rest-assure matcher for every single request, don’t follow any redirect, parse the Location-header and write a new rest-assured request for the following necessary request so that you can be sure that your test-setup follows strictly the web application’s requirements for authentication there, be sure to set all headers needed. I am new to rest Assured. I am running Rest api test cases in eclipe with jdev. I want to connect to remote “HTTP” server to get auth token. This will give auth token. When i used SERVER with https and setting sslconfig() in setup i could connect. But if i use “http” server i am not able to connect itself. Tried by setting proxy as well with given().proxy(“prxy” , port). When I use POST for the same code – it works perfectly fine. Also PUT works in PostMan. Thank you in advance. Vlad. your REST-API does not need require you to send a body our content-header in your PUT request? e.g. You could add loggers to your request- and response-specification to receive more details about what rest-assured is doing and receiving e.g. Does the similar request execute without error when you’re using Curl directly like this? Micha, please desregard my last message – I found the problem: PUT is working but sometning wrong with my request this time. Your advise to use expect().log().all() was REALLY helpfull..
Btw .. you could shorten your test e.g. I think there is a chance that you’re using conflicting versions of the Apache HTTP client (Groovy’s HTTP Builder is just an adapter to https://hc.apache.org/). Under the hood, rest-assured uses Groovy (and therefore it is added as a transitive dependency) – maybe you’re using either Groovy or the Apache HTTP Client somewhere in your project? Please feel free to keep me up-to-date if you still encounter problems here. mvn dependency:list and mvn dependency:tree might help you here when analyzing your project’s dependencies. The REST response when validated via Postman, it works fine. Could you guide me on resolving this. is it possible that you’d like to fetch the response body as string? e.g. response.getBody().asString(). java.lang.AssertionError: Expected status code doesn’t match actual status code . please provide more detailed information here e.g. the corresponding Curl command that manages to establish the connection using basic auth. just to be sure – you’re able to access this address in your browser entering the specific credentials? You’re getting a response with status-code 200 when running the following curl command? Afics the URL to the service is not correct http://localhost:8080/rest-assured-example/service/secure/person should be http://localhost:8080/service/secure/person (in my tutorial’s sample server application). Also please update framework version to 2.8.0 or give link to find latest one. Meanwhile since the authentication process is working when using curl, you could simply replay the steps by specifying each header sent manually .. e.g. I am facing javax.net.ssl.SSLHandshakeException: Received fatal alert: handshake_failure while using rest-assured. I have tried a lot of things but still its not working. Can you have a look at this and let me know if you can help in this? Please help me around this problem. I hope you are doing great. James, I am trying to automate below REST API using RestAssured. The service exposes a login endpoint ( /login) which takes a POST request with two parameters: username and password. Following a successful login, an authentication token will be returned which must be used to make additional requests to the service. Thing is that on post request on login I will get back token I need to store this token and pass it in susbsquent request. I tried using below code its not working..First .parameters is deprecated not sure how to replace it and with what?Also not sure how to use JsonPath? Who is James? My name is Micha. In addition you might create a request-spec to reuse-the auth-token-header for the following requests. I am novice to coding, but have little experience in Coding. I know how to launch(.war) files which i did for Jenkins. In command prompt, i just give java -jar “path of jenkins.war file” which launches Jenkins. Similarly, i wanted to launch or start your sample web service application. For that i downloaded “rest-assured-example.war” file and tried to launch by java -jar “path of this war file”. Is this is the right process? or can you please help me with some pointers to start this sample application. Can you help with detailed steps how to configure this sample application? in the Jenkins war-file there is an embedded servlet container included and a main-class entry in the manifest file allows you to start this embedded server but it is NOT the default way to run war-files – it’s important to know that! For your use-case you could download and install a decent servlet container like Tomcat (https://tomcat.apache.org/) or Jetty (http://www.eclipse.org/jetty/), start the server and install the war file .. or if you’ve got the build tool Maven (http://maven.apache.org/) installed – what you’re likely to have installed as a Java developer, simply change into the directory of the sample application and run this command: mvn tomcat:run as documented in my tutorial here. How can I get all the “id” values from all () to use them as a parameter in another request? I have a question about the below response. Generally if I have to extract just one element, I do like this. Could you please help in this one? just use the following JsonPath expression to match the designated JSON nodes and then use extract() and path() to fetch the participantId. The path to query for is: $..events[? (@.name == 'b' && @.eventType == 'MEETING_JOINED')]. //Sending request and saving response in a “eventsResp” variable. Looks Like Response eventsResp should be converted to Json String. Could you please let me know how to do that conversion? I’m not sure what you’re doing now, but you may get the body string from a response by using response.getBody().asString(). Thank You Micha for the response. It worked. Now I got a different question. I would need to assert this output to make sure it contains participantId:”3bc9qkw48ucdpwxm4ymxrqjgs”. Note: we cannot go by index here. Could you please clarify when you get a chance? If I have to print only the last last one instead of forEach, how to do that? if index-based, then events.get(events.size() – 1), otherwise stream() and filter() might be a choice (java8). I have one scenario for automation where I should do the following. 1. Launch the browser url. After successful authentication, I would need to get one of the Cookie value from Application column. Why do you need to use chrome? Hi Micha, Without going to Chrome, can you please suggest how to get all cookies using rest assured? I have a below String. Could you please let me know how to convert to JSON String and get the conversationId value? you could use regular expressions to extract the information needed.